Living in Washington State – or any other part of the US – is daunting for those who don’t speak English fluently. From what I gather, litigating a divorce as a non-English speaker can be far worse – seemingly impossible and frustratingly unfair at times, especially for a party with limited funds. Thankfully Washingtonians have access to numerous divorce-related foreign language resources, including bilingual attorneys, free court interpreters, and free multi-lingual court documents and templates. In this article I identify five such resources and explain how to access them. Our great state of Washington hosts nearly countless bilingual attorneys, though finding them can be difficult. Washington’s bar association makes locating bilingual counsel somewhat easier by providing a lawyer database searchable by language, location, and practice area (legal subject area). For example, the database could help you identify all the Spanish speaking family law (divorce) attorneys in Seattle. To access the database, simply click here or go to wsba.org and click on the “Lawyer Directory”. Notably, you should NOT hire an attorney merely because he or she speaks your language. Many bilingual attorneys are generalists and/or produce notoriously poor quality legal work. If possible, hire someone who focuses his or her practice in just one or two areas of the law and has a strong academic background. You can also find online reviews of attorneys and law firms by performing a Google search containing the language + legal subject + “attorney” + location. 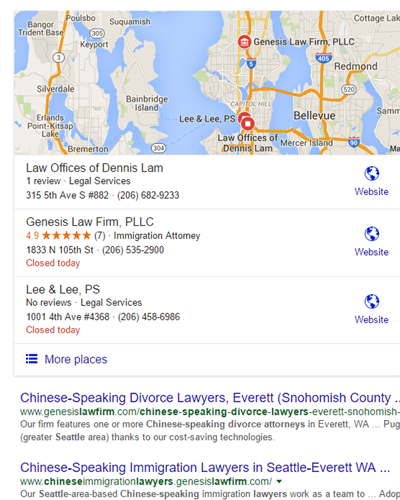 For example, a Google search for “Chinese-speaking divorce attorney Seattle” yields a page that looks like the image to the right (or below, depending on your browser). A selfish advertisement for our law firm: our China Practice Group is comprised of several highly competent Chinese-speaking team members, including a Mandarin Chinese speaking divorce lawyer working from our Seattle and Everett locations. RCW 2.43 requires all courts in Washington to offer divorcing parties interpreters in virtually every foreign language. These interpreters only assist inside the courtroom, such as with what the opposing party and judge are saying, and someone must request the interpreter in advance. For non-English speakers who income qualify as indigent, courtroom interpreters are free. Most if not all superior courts in the Puget Sound have the relevant request forms and/or fee waiver forms available on each county’s respective website. If the jurist (judge or commissioner) presiding over a matter believes a party is in need of an interpreter, the jurist may continue the matter to a time and date when one can be made available. The state of Washington produces family law court forms in common foreign languages, including Spanish, Russian, and numerous Asian languages such as Chinese, Korean, and Tagalog. The list of translated forms is extensive, and each of the documents are quite useful. Click the links in this sentence for court forms in Spanish, Russian, and Chinese. A nonprofit legal service named CLEAR (also called Northwest Justice Project) offers free legal assistance to divorcing parties who income qualify. That assistance includes free interpreters for conversations between the organization’s personnel and non-English speakers. Northwest Justice Project’s Spanish-Speaking web portal is available here: https://www.nwjustice.org/ayuda-en-espa%C3%B1ol. Rev.com provides reasonably priced and very fast document translations. Our firm has no affiliation with rev.com. We recommend rev because it is the best of the translation services our firm has tried. For more free articles on various legal subjects, feel free to visit the ‘resources’ section of our firm’s website, genesislawfirm.com. Or call us toll free at 866-631-0028 to speak with one of our knowledgeable attorneys. Our phone tree is in both English and Mandarin Chinese.